While Bach's other works for unaccompanied instruments — the Suites for solo cello and the Sonatas and Partitas for solo violin — were all informed to one degree or another by his own skill as a string instrument performer, with the flute Partita Bach was left almost entirely to his own ingenuity, as neither tradition nor personal familiarity could come into much play during the creation of such a work. 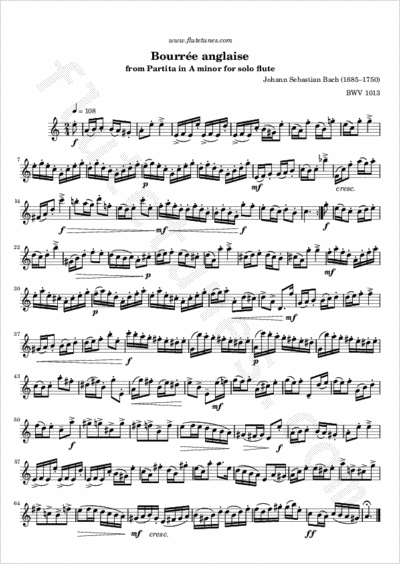 The Bourrée anglaise which closes the Partita is probably the most immediately arresting of the four movements. Judging from the many appearances of this particular subspecies of the bourrée that pop up in the music of Bach, Handel, and other composers of the time, this form was then well in vogue throughout Europe. It is built around a typical “backwards” short-short-long rhythm, set up in this case as the counterbalance for more florid running sixteenth note passages.